On the first day back to school from summer vacation, John is the new kid. When the librarian asks him if the school is any different from his last one, he begins a wildly imaginative story about what it was like. 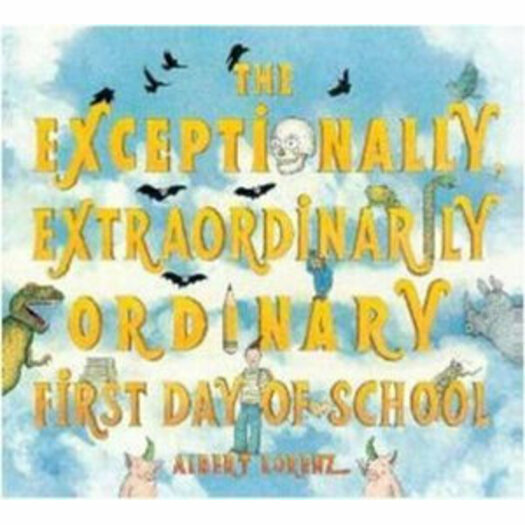 What follows are hilarious scenarios--his old school bus was a safari jeep pulled by wild creatures, the school was a castle, and the lunch menu included worms His imagination wins him the attention and awe of his librarian and peers, setting the tone for a compelling story about conquering the fears of being a new kid, as well as the first-day jitters that many children experience. Albert Lorenz's over-the-top illustrations, reminiscent of the work of "MAD" magazine's early artists, bring the story to life. Speech bubbles and side panels make reference to and define objects in the art (in the most humorous and irreverent way).